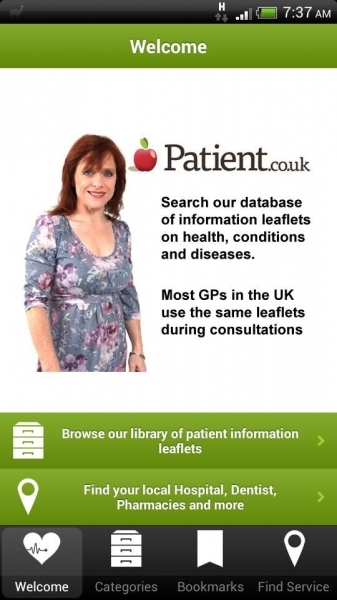 Patient.co.uk have been providing a vast number of patient information leaflets for many years. They are built into the popular EMIS clinical system and are thus part of the workflow for many UK GPs. A few years ago, I would typically print many of these leaflets for patients during the consultation. Recently, though, as more and more people have internet access, I have begun to write down the internet address rather than printing a leaflet. 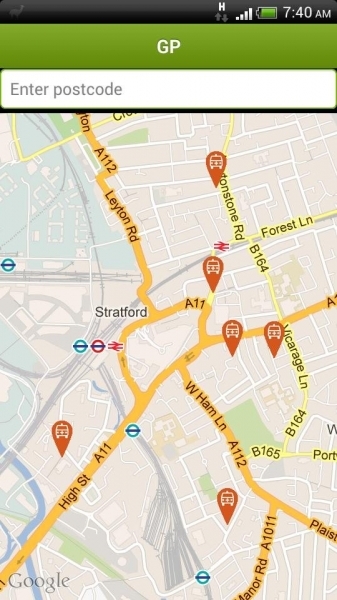 The patient.co.uk app takes this one step further, with all their leaflets made available for free on a mobile device. Downloading and installing the app from the Play Store is simple enough, and no registration is needed on starting it up, which is a definite bonus. Once clicking past a rather disconcerting–but I guess necessary–disclaimer, the user is presented with a clean and simple front screen. Clicking to browse the library of leaflets brings you to an alphabetical list of systems, leading into sub menus of various conditions. Perhaps more useful is the search box at the top of the page. It’s worth pointing out here that this is very much an information app rather than a diagnosis app. By that, I mean that you’ve really got to know what you’ve got before it is 0f any real use. 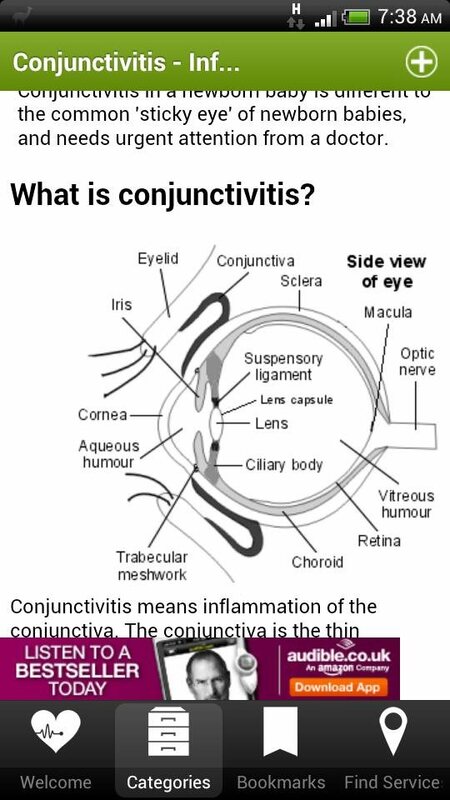 Search for infective conjunctivitis and you get a very comprehensive information leaflet with details on pathology, natural history, and treatment options. Search for sticky eye and you get… nothing. 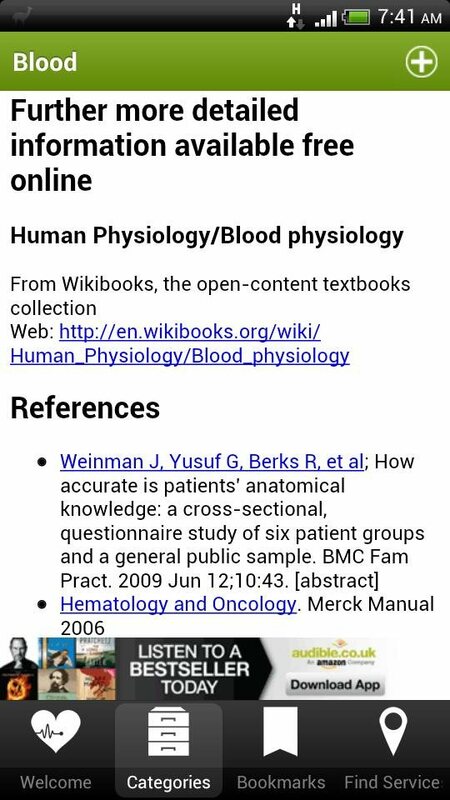 The content, as you’d probably expect from patient.co.uk is top notch: clearly-illustrated, regularly reviewed, and well-referenced. The “read more” section at the bottom of each leaflet is, for me, one of their real strengths as it gives access to other sources of information on the web as well as helplines and support groups. There is also a Find Service button which pulls data from NHS Choices to find your local GP, Hospital, Optician etc. I suppose this might be useful in some cases, but it does feel like a bit of an afterthought and is somewhat clunky to use. Clicking on the button brings up a menu of services to find. If you click, for example, on GP, then the app tries to locate you using your GPS. If GPS isn’t switched on or available, then you can’t go any further; there’s no option to search by postal code without switching on your GPS first. My other issue with this bit of the app is what it is used for. I’ve already mentioned that this is an informational rather than diagnosis app, so most people will only be turning to it once they have seen a physician. 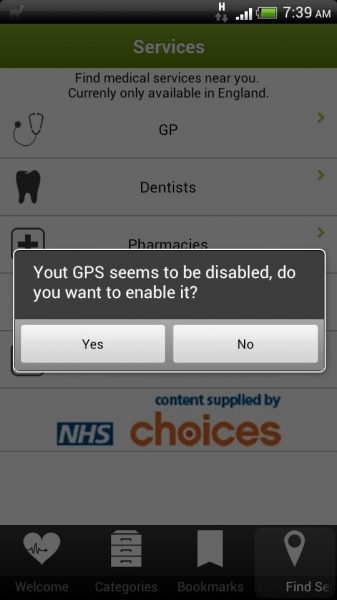 I see the app more as something that a healthcare professional will signpost the patient to use, rather than the app signposting the user to a healthcare professional. But having said that, if they can fix the bug in this area and generally speed it up, then it might be a useful addition for some.